This was the hardest spot to fill, because in truth none of these adaptations are perfect (except maybe for Pride & Prejudice, but as I don’t recall the novel that well I refrained from picking it): Kazan’s East of Eden only covers half the novel, Yates’s Revolutionary Road lacks story weight and focus, and Hitchcock’s Suspicion was significantly limited by studio pressure, altering some of the novel’s best aspects. 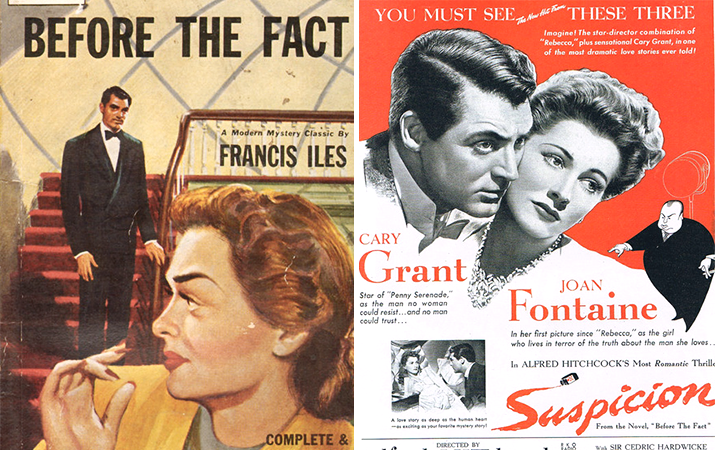 Ultimately I have to go with this 1941 thriller, which despite altering the nature of its protagonist – or rather, leaving it hanging in doubt – manages to capture the novel’s tension and claustrophobia as our victim Lina becomes more and more suspicious that her husband Johnnie is trying to murder her. Francis Iles’s novel is far more twisted and daring, but Hitchcock’s piece will still give you shivers, and some of those wicked laughs we love. In A Single Man Tom Ford aestheticizes mourning, solitude and desire in ways that make our mouths and eyes water for hours. His refined taste is behind every shot, in a movie that is so meticulously constructed that it would be in danger of turning out hollow, if it weren’t for its incredibly moving story, brought to life by a hand-picked cast. 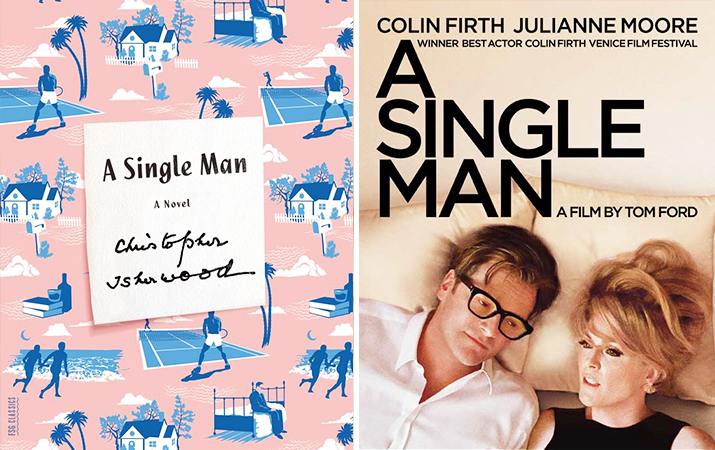 For that story we credit Christopher Isherwood, who in the novel by the same name explores the loneliness of being different, the desolation and numbness of grieving for someone you loved – and his writing is as beautiful as Ford’s visuals. Read this for my thoughts on A Single Man‘s cinematography. Now, the ultimate classic adaptation, so good that I honestly can’t choose between novel and film. That said, it’s not an easy movie to love. As A Single Man, Jane Eyre is a sensory piece. It moves through the novel’s material swiftly, which to an inattentive audience or even a non-book reader can undermine the dramatic weight and intricateness of its themes. A familiarity with Bronte’s work also benefits the film where it comes to some symbolic moments and shots that will pass unnoticed if you can’t spot their meaning. All of this reveals that Fukunaga truly immersed himself in the book, taking from it everything he could get onscreen without it becoming too confusing for those who haven’t read Jane Eyre. Such care resulted in a film that for once captures the essence of a gothic novel that is as mysterious and eerie as it is emotional and romantic. The cast of Fassbender, Bell and Dench did the story justice, but it was Wasikowska who wowed me by finding that rare balance between fragility and strength that is so particular of Jane. Read this for my review of the film, and this for my thoughts on its cinematography. Forgot to mention rules stated that no plays or poems could be on the list! Hence the lack of Tennessee Williams. Hi Sofia, lovely post today. I enjoyed the Jane Eyre film adaption far more than I thought I would. Have you ever seen/read ‘Wide Sargasso Sea?’ The 1993 version? I say that b/c I believe it is based on ‘Jane Eyre.’ I loved the 1995 Pride and Prejudice…although it is incredibly long. I wish the Keira Knightley version had been 1/2 hour longer. No, never heard of it! I see it is about Rochester’s wife. The book sounds interesting, but the film is not something I’d usually watch… is it really good? I never saw the Pride and Prejudice mini-series – I know – but I agree with you on that the 2005 version could be longer. I think (and I felt that with Jane Eyre as well), because these novels usually have a rather slow pace, when you see it all compressed on film it feels rushed. I would definitely recommend the book, “Wide Sargasso Sea.” I remember seeing the film when I was a freshman in high school, so clearly I was very young and didn’t quite understand it or relate to it as well as I would now. I probably was too young to watch that movie, but I remember that the movie was good and that it received good reviews from Roger Ebert. What I thought was interesting was that it was the flip side of Rochester’s version. It was all about the forgotten wife and how and why she went mad. From that perspective I think it would be good to watch in combination with Jane Eyre. I would definitely recommend watching the 1995 ‘Pride and Prejudice’ miniseries. It was so fantastic, but long. The payoff of course is much better than the 2005 film because you have a lot invested in the characters. Good picks, the only one I haven’t seen yet is Revolutionary Road. My favorite of the six is East of Eden, it’s my favorite book as well. It’s understandable that they would have to focus on only half of the novel to have a film of reasonable length and Dean is brilliant in it but Kate is such an amazingly complex character it’s a shame she had to be sidelined in it. Have you ever seen the Jane Seymour mini-series of the entire book. It has it’s problems but Jane is brilliant as Cathy/Kate. Of your main picks loved A Single Man and liked Suspicion though they had to cut the guts out of it for the production code. 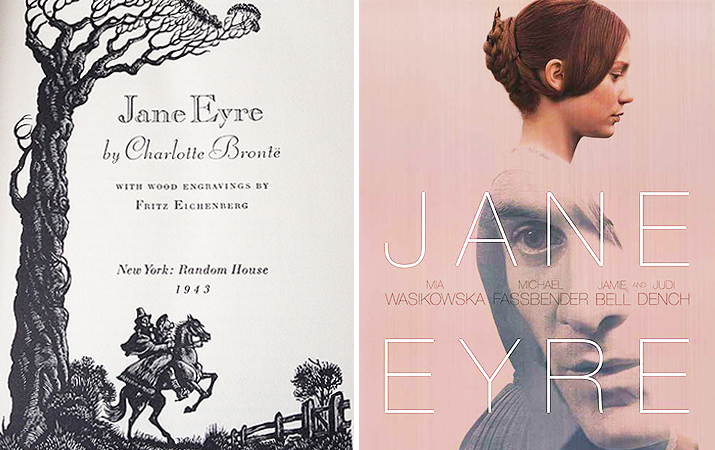 I’ve never been a fan of Jane Eyre she’s too wan for me but this version is nicely done. Yes the novel is far too big for just one movie, but I actually found the first half of the novel more interesting than the second, precisely because of Cathy. So I guess in a way that would make Kazan’s adaptation one of the best since I liked it better than that second section of the book. No, I’ve never seen it! Yes, Suspicion the movie looks like a different story, it’s a shame. I was surprised by how much I loved the novel, and I can totally imagine Hitchcock loving it too and wanting to adapt it immediately – which he practically did since Before the Fact was published in 1932. I love the whole of East of Eden but I agree that Cathy’s absence is sharply felt in the second portion. It’s easy to see why they would hone in on the Cal/Aron/Adam characters as the most easily adaptable since their conflict is more sharply drawn then Adam & Charles with their father. Would love to have seen an adaptation of the first part of the book back in the studio period, what a choice role for Vivien Leigh or Ava Gardner, but again because her story stretches throughout the book to its conclusion it would have been a challenge to adaptation. There’s a rumor that a new version is in development but all the proposed Cathy/Kate’s, Jennifer Lawrence (a fine actress but missing that hard edge) Kristen Stewart (just UGH!) make me sad. Right now I can’t think of a contemporary actress who would fit. Rachel Weisz would be my choice, I think she’d be perfect but she might be a shade to mature to get away with the very young Catherine section of the story. However if they only focused on that briefly and photographed her properly I could envision her being amazing as both Cathy and Kate. Oh people always complain – too young for this, too old for that… I thought he was perfect, had that masculine allure but still a darkness to him that tainted the romance.